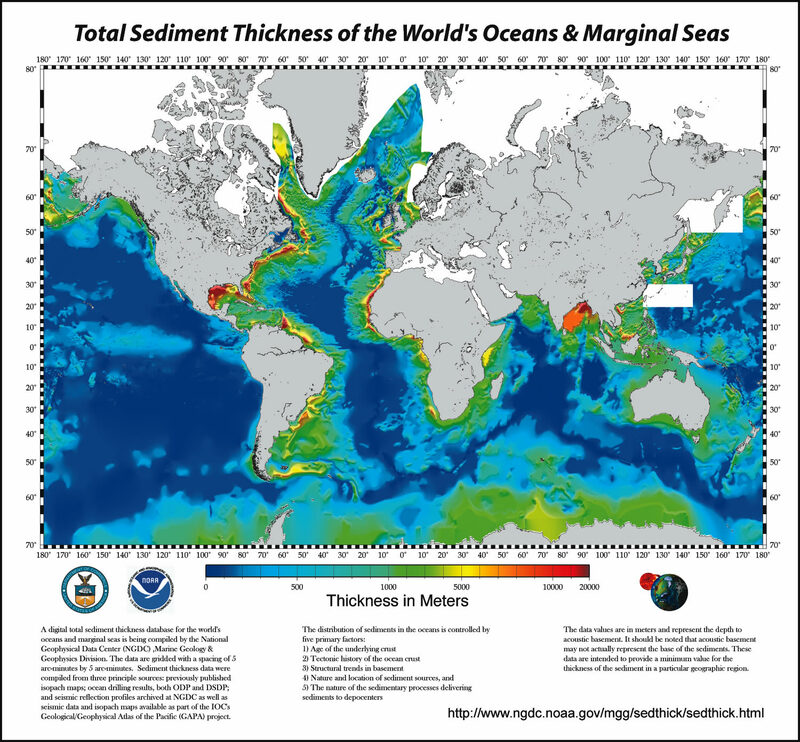 Image of total sediment thickness of the world's oceans and marginal seas. A digital total-sediment-thickness database for the world's oceans and marginal seas has been compiled by the NOAA National Geophysical Data Center (NGDC). The data were gridded with a grid spacing of 5 arc-minutes by 5 arc-minutes. Sediment-thickness data were compiled from three principle sources: (i) previously published isopach maps including Ludwig and Houtz , Matthias et al. , Divins and Rabinowitz , Hayes and LaBrecque , and Divins ; (ii) ocean drilling results, both from the Ocean Drilling Program (ODP) and the Deep Sea Drilling Project (DSDP); and (iii) seismic reflection profiles archived at NGDC as well as seismic data and isopach maps available as part of the IOC's International Geological-Geophysical Atlas of the Pacific Ocean [Udinstev, 2003]. Purpose To create a global sediment-thickness database for use by researchers and interested public. 2000-01-01T00:00:00 - The sediment isopach contour maps for the Pacific were digitized by Greg Cole of Los Alamos National Laboratory, for the Indian Ocean by Carol Stein of Northwestern University, and the South Atlantic and Southern Ocean by Dennis Hayes of Lamont-Doherty Earth Observatory. 2003-01-01T00:00:00 - The digitized data were then gridded at NGDC using the algorithm for "Gridding with Continuous Curvature Splines in Tension" of Smith and Wessel .